Over 340 artists and art supporters attended the preview reception for Joan Brechin Sonnenberg: The Middle Point, Members’ Gallery: Florida Inspiration, and Breaking Through with Color: Artists Reveal the Power of Color on February 22nd. Attendees were treated to a jazz trio from Edison College, refreshments, and gelato from Sweet Ginger’s. Five artists received awards for works featured in the exhibitions. The winners from the Florida Inspiration exhibit were: Tanya Trinkaus Glass whose work Coco-Nuts won in the Bold Spontaneity category, Beth Wiese whose work Untitled I won in the Innovation- Experiment category, and Yelizabet Herrera whose work Origin won in the Technical Achievement category. The winners from the Breaking Through With Color exhibition were: Patricia Place Caldwell whose work Juice & Fruit won First Place, Veronica Benning for Sunflower Bouquet on Coral in Vase. Honorable mentions went to Leigh Herndon for her work Layers and Tanya Trinkaus Glass for her work Summer Sail. During the evening, artists and patrons enthusiastically browsed works in a variety of media. From the stark weight of Pam Schmidt’s Heavy H-art, created from cast-lead, bondo, and epoxy paint, to the heartful whimsy of Sundance Etienne Latour Genore Hughs Sheppard’s Raison d’Etre, painted with acrylic, each work offered a particular facet of the art culture that is vital to our community. Breaking Through with Color is on view until Jan. 11th. Florida Inspiration and The Middle Point are on view until Jan. 18th. Five artists received awards for works featured in two of the exhibitions that are currently hosted by the NAA and on view at The von Liebig Art Center. The exhibitions are Florida Inspiration and Breaking Through with Color: Artists Explore the Power of Color. Florida inspiration asked artists to consider all of the features unique to Florida that have dazzled explorers, dreamers and artists for centuries. Using features and facets of Florida as inspiration, artists created many great works of art in myriad media. Breaking Through with Color: Artists Explore the Power of Color is about showing the power and force of color within art. Color has an influential place in our lives. It can alter our emotions, affect our thoughts and inspire new ideas. Color can be pleasing and create a sense of calm serenity or it can be just the opposite. Some colors or combinations of colors can cause agitation and even make us feel uncomfortable. In Breaking Through with Color, the challenge to each artists was to be inspired by, and represent, the power of color to influence. Five artist recevied awards for works featured in two of the exhibitions. The Breaking Through with Color exhibit included First Place winner Patricia Place Caldwell for Juice & Fruit, Best of Show winner Veronica Benning for Sunflower Bouquest on Coral in Vase. Two honorable mentions went to Leigh Herndon and Tanya Trinkaus Glass. The Florida Inspiration award winners included Tanya Trinkaus Glass whose work Coco-Nuts won for Bold Spontanity; Beth Wiese’s work Untitled I for Innovation-Experiment and Yelizebeth Herrera whose work Origin for Technical Achievement. The winners from the Florida Inspiration exhibit were: Tanya Trinkaus Glass whose work Coco-Nuts won in the Bold Spontaneity category, Beth Wiese whose work Untitled I won in the Innovation – Experiment category, and Yelizabet Herrera whose work Origin won in the Technical Achievement category. Tanya Trinkaus Glass lives in Naples with her husband and their Golden Doodle and summers in Barrington, Rhode Island. She is a plein air, studio, and figural painter, always playing and experimenting with different media. In her art, Tanya is continually experimenting to find the best way to express herself in order to communicate her visions, her inner soul, and her impressions. Beth Wiese is an artist and sculptor whose work, Untitled I, won the Innovation – Experiment category. that bright light appear on the horizon just for you! She sees the power of choice and believes that it is always your choice to make “it” better. 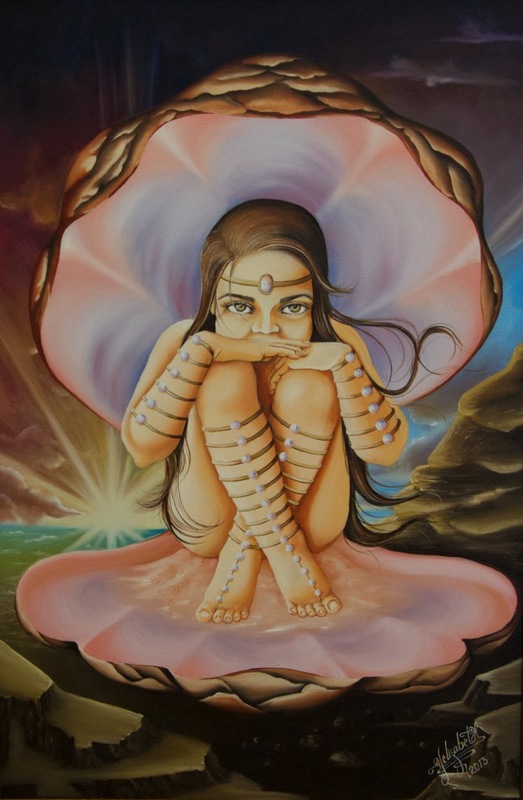 She says, “You can become that small grain of sand that became that Amazing Beautiful Pearl”! The winners from the Breaking Through With Color exhibition were: Patricia Place Caldwell whose work Juice & Fruit won First Place and Veronica Benning for Sunflower Bouquet on Coral in Vase, which won Best of Show. Honorable mentions went to Leigh Herndon for her work Layers and Tanya Trinkaus Glass for her work Summer Sail. Patricia Place Caldwell prefers to use simple composition, tense color relationships and flat surfaces. She says, “Subtraction is conceptually more interesting and poetic than expression, hence the isolation of the objects [in my work]. She uses compressed space to generate intimacy between the viewed and viewer while luminous shadows formulate the external light. Veronica Benning taught for thirteen years as Associate Professor of Painting at the Maine College of Art in Portland Maine and as Instructor at the University of Maine. In her work, she uses oil, acrylic, watercolor, gouache, ink and graphite. She often works from the still-life or landscape to produce the over-all color condition. For her, painting is the beauty of one pot of color with another in size, shape, and position relationships. She considers painting a study. She describes the importance of painting as a process and appreciates Wolf Kahn’s description of beautiful color as a “crab like” and “sideways” discovery. She and Kahn believe painting with color is sideways, because it is a trial and error process. As a painting changes, the painter discovers possibilities and makes choices. 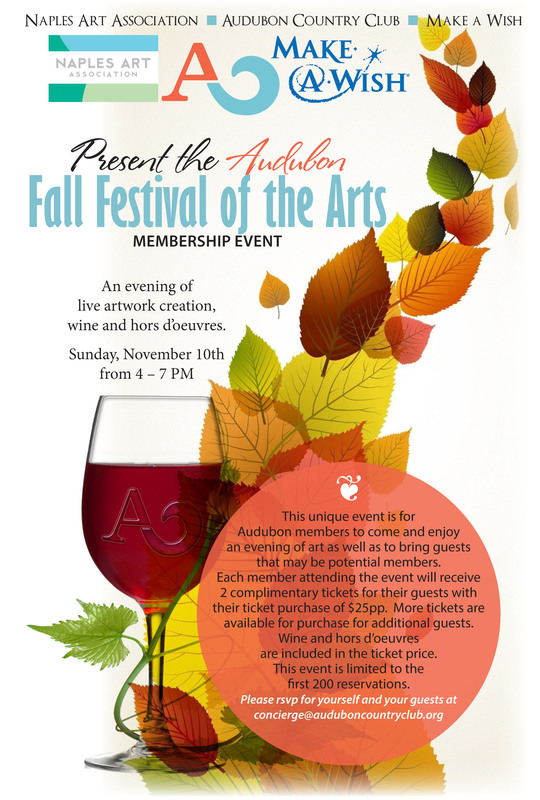 The Naples Art Association proudly collaborated with the Audubon Country Club at The Audubon Fall Festival of the Arts on Sunday November 10th. The event, which lasted from 4 p.m. until 7 p.m., featured member artists, live artwork created on site, wine and hors d’oeuvres. Artists were on hand to exhibit and discuss their work and did a great job of engaging guests to imagine, discover, and create. The location for the event was absolutely beautiful. The Audubon Country Club is stocked with lush foliage and fantastic trees. The building itself was beautiful and well-appointed for the event. 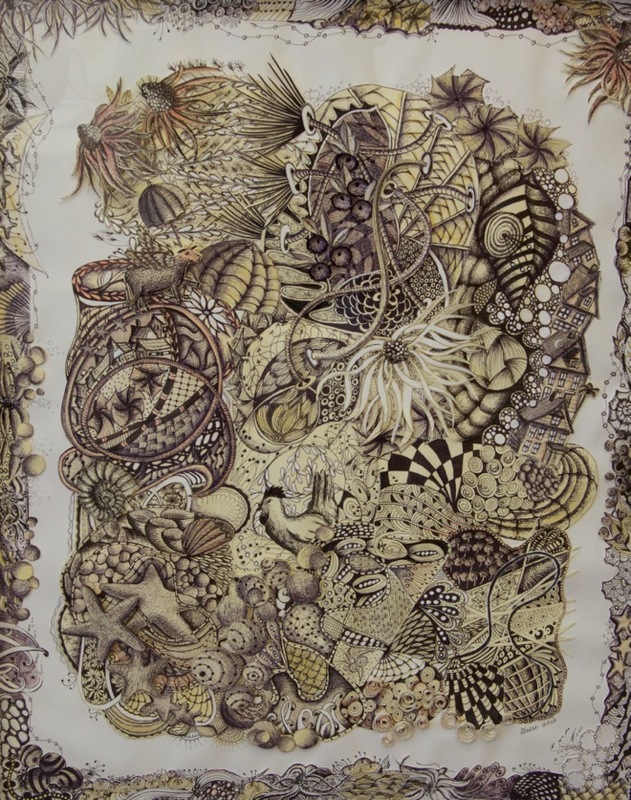 Leigh Herndon was on site demonstrating her process painting on silk. She was excited for the opportunity to show her process. She believes that live art demonstrations are exciting to visitors. When she began demonstrations, guests quickly collected to discuss and ask questions about Leigh’s Asian-inspired Rozome painting techniques. She relishes the interactivity of art and especially live art demonstrations. She said that her art is meant to request the viewer “to participate in the piece and see the way it works for them.” Although she was speaking about metaphor in her art when she was quoted, she undoubtedly appreciated the extra audience participation garnered from her live art demonstration. The successful event was for Audubon members to enjoy an evening of art and create an opportunity for local artists to demonstrate and sell their work. The Naples Art Association seeks out quality opportunities, like the Audubon Festival, for local artists to showcase their work. of the world’s leading cultural festivals. harmoniously with the high desert landscape! We are planning to see DON PASQUALE and FIDELIO; CARMEN is optional. Included are a Day Tour of Santa Fe and The GEORGIA O’KEEFFE MUSEUM. The TAOS MUSEUM, MILLICENT ROGERS MUSEUM and TAOS PUEBLO. Our tour will be extended for an additional four nights to MESA VERDE, DURANGO, and ASPEN for those who want more of the beautiful Southwest! A donation will be made to the Naples Art Association for each reservation. 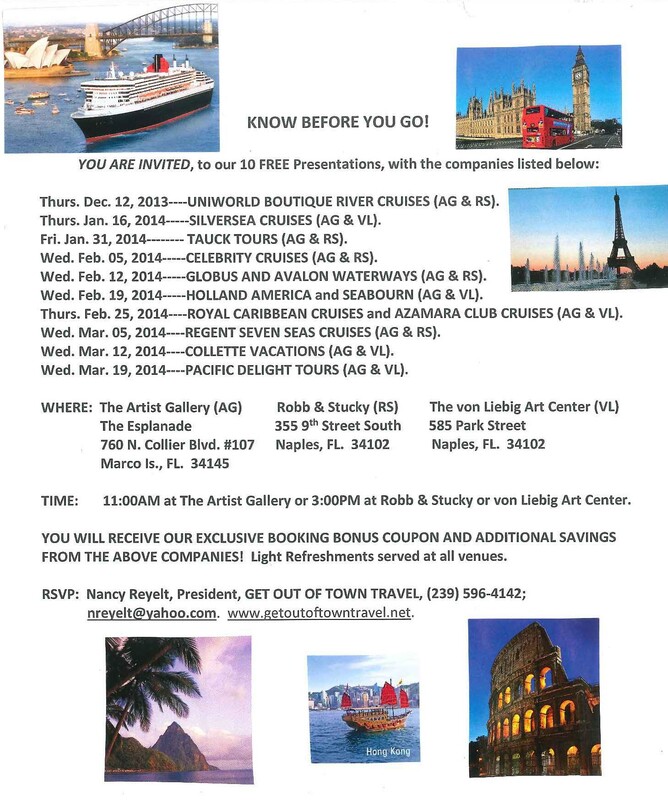 Nancy will also be hosting several informational cruise presentations at the von Liebig Art Center, for dates and times please click on the link. A new program hosted by the Naples Art Association will help people living with Alzheimer’s and other associated dementias to make connections within themselves and to their families through the arts. The first class begins Oct. 1, 2013 at 10:30 a.m. A second program will be offered later this spring. In this six-week, Tuesday morning program for participants and their caregivers, the emphasis will be on the benefits of encountering, experiencing and creating art. Naples Art Association Executive Director Aimee Schlehr says this program is exactly the type of opportunity the organization wants to make available to the community. “Art has the power to lift us up, give us a voice and is such a strong connection to who we are as individuals. We enthusiastically included the Arts and Alzheimer’s course in our offerings because we believe in the healing power of art,” Schlehr said. Interactive gallery walks and conversations will introduce participants to specific works of art while engaging their reactions and recollections. This will be followed by an opportunity to create art in various forms in the studios at The von Liebig Art Center. Co-directors Bernadette La Paglia, BSN, M.Ed. and Angel Duncan, M.A., MFT, ATR, will be joined by several guest presenters throughout the six weeks. Violinist Daniela Shtereva, who holds the Naples Philharmonic Orchestra David & Cecile Wang Chair, and internationally acclaimed pianist, Dr. Alexandra “Sasha” Carlson, are among the musicians who will interpret works of art at the gallery through music. 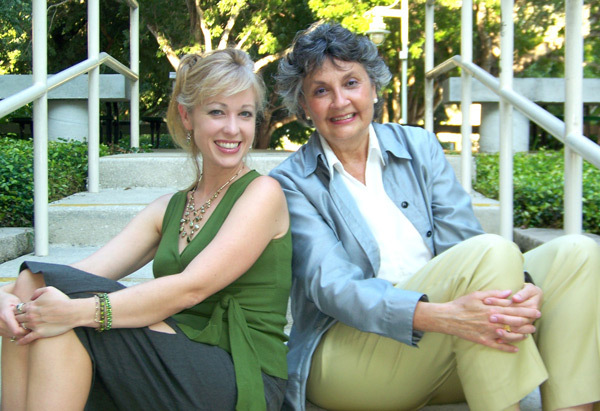 Additionally, Dr. Natasha Lidow, President of the Opera Naples Guild, will be contributing to program development. Renowned local artist Paul Arsenault will be also be a featured guest who will lead a discussion on art and facilitate a workshop. Each session will conclude with helpful, practical information for caregivers. In addition, emphasis will also be placed on the Medical Arts, factoring in the importance of exercise and good nutrition. Whole Foods will be donating box lunches to be enjoyed in Cambier Park. La Pagila, an educator, artist and registered nurse emphasizes the capacity of the arts to accommodate an aesthetic approach to working with those afflicted with Alzheimer’s. “All too often, they are left out of the loop of life, but the arts are all inclusive. They enhance our ability to empathize, affirm and engage,” La Paglia said. Duncan, an art therapist and mental health counselor, concurs. “We want to reintegrate them back into the community and help others recognize them as individuals, not as a disease. Having the means of coming to a safe and welcoming place in the arts bridges these connections. Here they thrive in a positive, social experience that sparks recognition, brings back memories, and increases their quality of life,” she said. Tuition for the six week program is free, thanks to a generous gift from Peter and Stella Thomas and sponsorship by Moorings Park. Of note, Gibraltar Private Bank and Trust is underwriting Paul Arsenault’s newly published book, My Journey as an Artist, for each participant. To register, please call 239-262-6517, as space is limited. Lynda Fay Braun will tell you right away, though she loves what modern technology has brought to the creative world, she is a painter at heart. The tactile feel of the brush against the painting surface moves and inspires her. She works from a garage studio off Taylor Road in Naples. Natural light pours in from roll up doors at either end. Always inspired by her surroundings, Braun has lived in beautiful locations. She moved from New York to Southwest Florida in 1998 and to New Mexico in 2005. She spent eight years in Santa Fe, absorbing the stunning natural surroundings and taking thousands of photos. Living in Naples now, she keeps her camera nearby. She’s been fascinated by images of water. When she works with them in Photoshop, she simplifies the image, looking for the basic outlines and patterns on the surface. The finished result often has a topographical, outlined appearance. Raised in upstate New York, Lynda Braun spent her early years between the rugged environment of the Adirondacks and the museums of New York City. A natural attraction toward the ineffable combined with an affinity for nature and an independent spirit compelled Braun to seek a life in art. Braun attended Boston Museum School of Art and Cooper Union School of Art, New York City; receiving an MFA in Painting from Cornell University, Ithaca, NY in 1973. As part of her assistantship at Cornell, she hosted a visit from Agnes Martin, a relationship which began a mentorship that lasted over 25 years until Martin’s death. 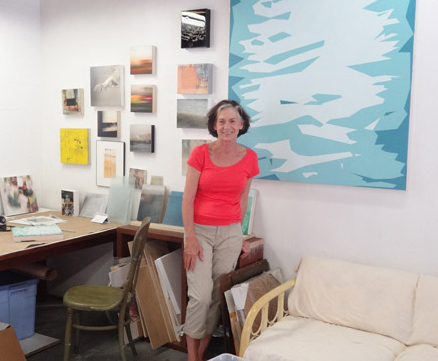 Her work has been exhibited in Santa Fe at the Center for Contemporary Art; Zane-Bennet and Linda Durham Contemporary Art Gallery. Museum exhibitions that Braun’s work has been included in are the Tabik Museum, Vienna, Austria; Johnson Museum of Art in Ithaca, NY, and the Empire State Museum in Albany, NY. University exhibits include a one-person show at FGCU and the Sibley Gallery at Cornell University. Brawn also has mentored art majors with the FGCU Internship program and continues to teach on occasion at the von Liebig Art Center in Naples, Florida. Braun is active with the Naples Art Association as an instructor and exhibiting artist. Braun will also share a free workshop presentation on Facebook Marketing for artists as part of ART Connects in the fall. She is the featured artist for the Edison State College Collier Campus exhibition, on view through Apr. 30, 2014.